The lovely Anthonissa over at One Strong Mother (@one_strong_mother) has a brilliant account on birth, sisterhood and also a hypnobirthing midwife, over on Instagram…one busy lady! After a terrible family tragedy this year, where a family member sadly lost her first baby, Anthonissa has designed a One Strong Mother pin to reach out a hand of support to every mother and father who has lost a baby. Every £5 from the sale of every pin goes straight to SANDS (Stillbirth And Neonatal Death Charity) and their research to prevent stillbirth in the future. 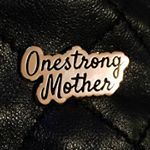 To purchase a pin and to see One Strong Mother’s website please visit the website here.